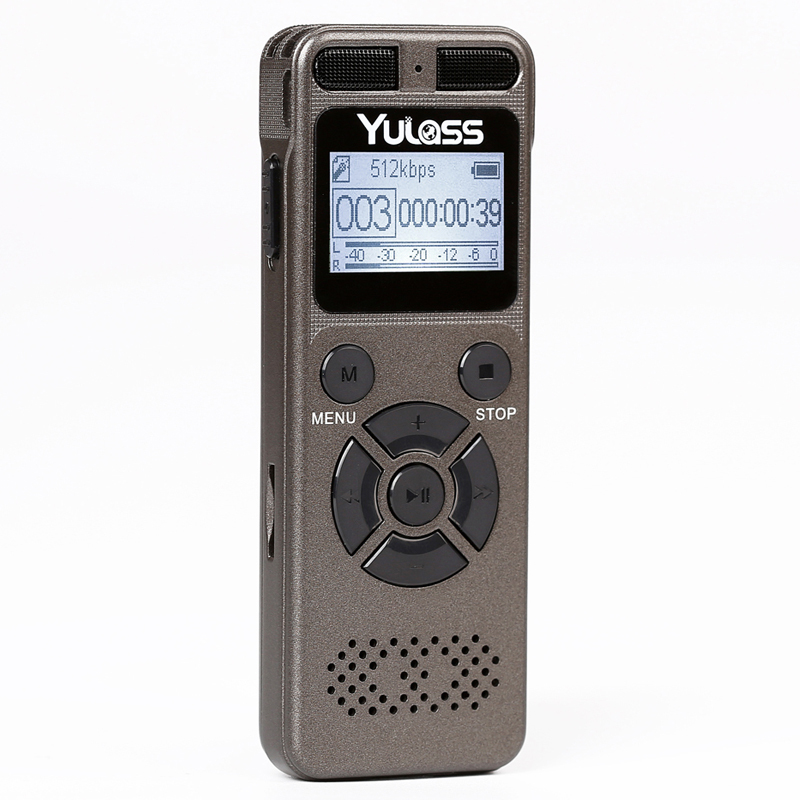 US $25.99	US $19.99	US $19.99	US $21.99	US $19.99	With a digital audio voice recorder in hand, you will benefit its great function of recording sound files in the office, classroom or on-the-go.The Yulass 8gb voice recorder player with MP3 function gray features super long time recording and playback, three general recording modes of LP/SP/HQ, and WAV/MP3 format available. The MP3 function allows you to listen to your wonderful music anywhere you want. With various storage spaces, the voice recorders we offer can meet most of your needs. Compact and portable,this digital voice recorder is your perfect companion. 1. Multiple play functions such as repeat, all tracks and A-B section replay function, support timer recording, time setting is more reasonable. 2. TF card slot, support expansion TF card (maximum 64GB), plus 8GB product capacity needn’t to worry about inadequate memory. 3. 128*64 LCD Screen & 1430mAhmAh Li-ion rechargeable battery, ultra low power circuit design, enable ultra-long time recording, continuous recording of up to 72 hours, three days and three nights uninterrupted work. 4. Support automatic voltage detection and protection functions, automatic shut off after 2 minutes standby to save power, no need to worry about the electricity consumption. 5. Enter password to start, protecting information in the recorder. 1.The case is made of high strength zinc alloy with drop resistance. 2.Professional recorder chips was adopted, support high-definition nondestructive linear recording 1536 Kbps. 3.One touch voice recording, support voice operated recording. 4.Support timer recording, time setting is more reasonable. 5.Integrated voice recorder, MP3, walkman as a whole. 6.Multiple play functions such as repeat, all tracks and A-B section replay function. 7.This recorder has a high- fidelity built-in speaker, voice can. 8.Super capacity battery enable ultra-long time recording. 9.Support automatic voltage detection and protection functions, automatic shut off after 2 minutes standby to save power. 10.Enter password to start, protecting information in the recorder. 11.Support USB 2.0, convenient to upload and download voice and music. 14.Support TF card to expand the memory, maximum 64GB. 15.Support timer switch, no need to worry about the electricity consumption.